Dijalo Property Group continues to drive and participate in initiatives geared at attracting talented previously-disadvantaged youth to the vibrant South African built-environment industry. More recently, it participated in the Construction and Property Week Exhibition, hosted by the South African Institute of Black Property Practitioners (SAIBPP) on behalf of the Construction Economics and Management School at the University of Witwatersrand (Wits University South Africa) in Johannesburg. The SAIBPP, a Section 21 Company, was established in 1996 to lead transformation within the local property sector by facilitating the entry of previously disadvantaged people into the larger industry, in addition to its focus on skills development. Held at Wits University Campus from 21 to 24 August, the Construction and Property Week Exhibition is just one of a number of initiatives that supports these important objectives, which are also in line with those of Dijalo Property Group. This leading black-owned property specialist’s skills and capabilities span asset management, development, consulting and facilities management services, as well as property investment. SAIBPP invited Nandi Malindi, an Investment Analyst with Dijalo Property Group, to give an insightful presentation on the activities of the property specialist, as well as to empower students with the advice they need to launch a successful career in property and construction. This included the many opportunities the larger industry had to offer and the best way in which to pursue them. Certainly, this young dynamic woman was the best candidate to speak on behalf of Dijalo Property Group and to field questions from students on behalf of the larger industry. This is considering Malindi’s own achievements as a young property professional, as well as her passion for empowering others and her willingness to impart knowledge. Importantly, she also shared her experiences pursuing a career in the industry, which received a welcome boost when she accepted an internship from Dijalo Property Group. “I emphasised the need to take chances and make the most of opportunities that come your way. This is exactly how I launched my successful career with a leading participant in the South African property industry. I sent 50 e-mails to various companies and managers before receiving a response from only a handful of companies, one of them being Dijalo Property Group. It was an easy decision to make, and I have since never regretted it. I have learnt so much from the group, which treated me as a real employee and part of the ‘Dijalo family’ since my first day as an intern,” Malindi says. She applauds SAIBPP for the role that it is playing in attracting young previous-disadvantaged people to the industry. Malindi notes that events, such as the Construction and Property Week Exhibition, play an important role in attending to the dearth of knowledge available to country’s youth who are considering long and prosperous careers in the property and construction sectors. This is compounded by a limited understanding of the many opportunities available in the built environment professions, further stifling the steady flow of young talent from institutions of higher learning to the property and construction industries. Certainly, the very positive feedback from students supports Malindi’s views that the week was a step in the direction. 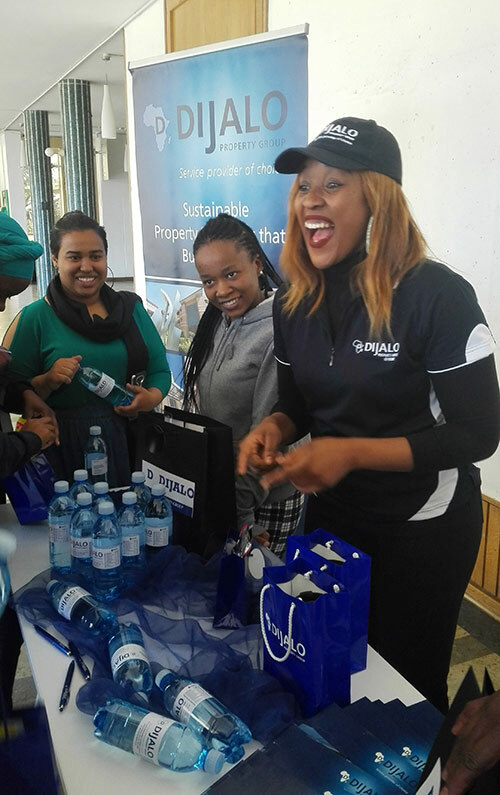 Meanwhile Hilda Mdluli, a first-year Wits student, says that she found the event and Dijalo Property Group’s participation extremely helpful in planning her future career path. “I, initially, knew very little about property-related studies and I didn’t know exactly what employment opportunities were available for me. As such, the week was extremely informative and the people from Dijalo Property Group were friendly and answered my questions in a helpful manner. Importantly, they spared no effort in explaining the profession and the many opportunities available at the group. Their booklets were just as helpful for someone who has just embarked on their journey in property. I thoroughly enjoyed and derived immense value from their efforts,” Mdluli says. Dijalo Property Group looks forward to future participation in the Construction and Property Week Exhibition, as well as other opportunities presented by the SAIBPP and the Construction Economics and Management School that promote the transformation of South Africa’s property and construction industry!